We are excited this week to share our third interview with Joanne Bernstein. Joanne is an educator, author, consultant, speaker and manager for non-profit organizations, primarily in the field of arts and culture management and marketing. Joanne is the author of Standing Room Only: Insights for Engaging Performing Arts Audiences which is a comprehensive sourcebook with up-to-date marketing strategies and techniques for theater, music, dance, and opera organizations. 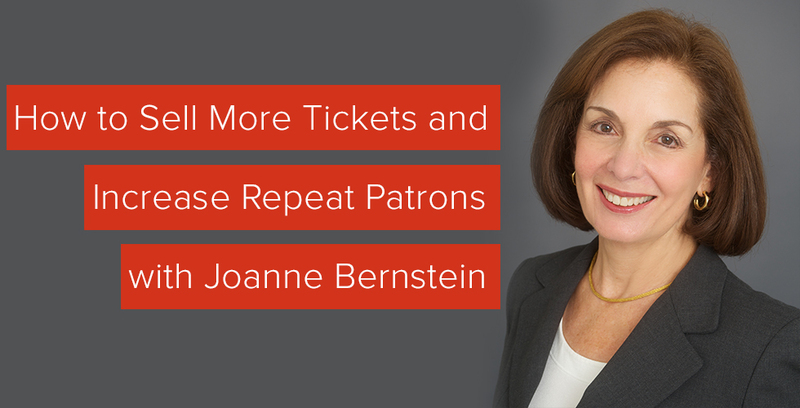 In this interview, Joanne discusses how to experiment with marketing to sell more tickets and how to increase repeat patrons. Enjoy! Hello Joanne! Thanks for chatting with us today. Do you have any suggestions for theatres that want to experiment with different selling or marketing strategies? Basically, when you do the same thing you’ve always done, you get the same result as you always have, if you’re lucky, because the reality is that the environment around us and people’s expectations keep changing. So we need to keep up with what our current and potential patrons prefer, such as offering online ticketing, for example. As for experimenting, any new and ongoing strategy needs to be really well thought out, analyzed, sometimes researched with the audiences and always monitored, so we know both what is working and what is not. And hopefully, you can get a pretty good idea why. We don’t want to experiment in the way we say, “Oh, let’s try this.” or “Someone is doing that, let’s just try it.” That isn’t the way to implement a strategy. You need to think about all the pros and cons, think about your audience, think about all the aspects of it, the cost involved, the possible benefits and be able to keep modifying it as you’re doing it. As an example, I was invited to consult with a symphony orchestra in a community that lost the hall that it was performing in and it had to move to another hall about 25 minutes away. The new hall had fabulous acoustics, free parking, and comfortable seats, but people were staying away in droves because it wasn’t the same community, because they were afraid to try something new, because they were used to traveling for 5 minutes instead of 25 minutes. One thing the managers experimented with before they brought me in was to hire a bus to meet ticket holders at a central location in a church parking lot and take people to this new venue. Well, nobody showed up for the bus! The managers couldn’t understand why, and they paid about $450 for the bus. I told them it makes it seem farther away when you offer bus service. This was suburban Chicago about an hour away from the city but a lot of these people are going down to the Chicago Symphony and the Chicago Lyric Opera, which was more than an hour away. But they were so reluctant to go to this far for a local orchestra. So, I wanted to write a letter to everybody who had subscribed in the old venue but had not renewed in the new venue, and offer them a pair of complimentary tickets to any concert that season. I got much criticism for this idea. “Oh, you can’t give them away for free.” I gave them all the reasons why I thought this was a good idea. It was going to remove a huge element of the risk for people. Not that the money mattered so much but it’s the idea that we were really reaching out to them and giving them a gift. And I said, “Look, none of you is responsible for this if it goes wrong. I take full responsibility.” And they were very skeptical but they said, “Okay, go ahead.” So I did this. I had a huge positive response and that season I increased subscriptions 40%. I also significantly increased single ticket sales. The birds of the feather principle: people who already attend are most likely to know other people who would be interested. So for every subscription of four or more concerts during the year, I offered them a complimentary guest ticket. So each subscribing couple received a pair of guest tickets. I told them that the only thing that we ask for in return is the contact information of your guests. Many people then had the opportunity to invite guests to come to the concert and then the guest would often take them out for dinner before the concert as a thank you, and this became a wonderful social event. When they came to the box office to pick up the guest tickets, they filled out a little form with the name, address, phone, email address of the guest and we built our mailing list that way, so we increased single ticket sale by 40% that season too. So, when you’re trying new strategies, you need to really think them out. Think what it will cost the organization and what the benefits are. If you have many unsold seats, this strategy works beautifully. If you’re sold out 98 percent, you’re not going to be offering free tickets. Aside from the social benefits, these complimentary gift tickets reduce the risk of attendance, of not liking the show. So, I’ve been saying that deep discounts are typically not a good idea, but there are times when offering something like this for free is the best idea. But it needs to be thought out very strategically. The point is that in marketing, the customer must be central to all the decisions and communications. Managers must put themselves in the hearts and minds of the consumer and develop strategies and programs that their audiences value. Too often, managers make the mistake of trying something they’ve seen done elsewhere, without considering if it’s right for their organization and their publics, or abandoning strategies and trying new ones without thoroughly analyzing if all the necessary resources have been devoted to the strategy or if other modifications would make sense. For example, I don’t like the idea of final sales — when you call and buy tickets and the order-taker says that all ticket sales are final. I think that all organizations should offer their patrons the opportunity to exchange tickets for a fee. So for $20 tickets, the fee might be $2 or $3. People have no problem paying that if they find they can’t come in order to exchange for another performance. A key reason for the exchange fee is that the organization doesn’t want to implicate the free benefit to subscribers by giving away exchanges to single ticket buyers. The way to get around that is by charging a small fee to the single ticket buyers. Many theatres find it difficult to get patrons to return to their theatre. What’s the best way to get people to want to come back? The rate of people who come once and don’t come back is actually about 80 percent. This is a huge problem in the whole industry. The key factor in getting people to come back, which seems incredibly obvious, is by offering superb quality art. People will come back if they love what you do, if they’re moved by it, and it becomes a valued part of their lives, and if they want to develop an association with the organization. If people come and they have a bad time, and they don’t enjoy it, why would they ever come back? Obviously, people have different tastes, so something that I love and that moves me deeply, somebody else may hate. But that’s the nature of every business. In the performing arts, we can only offer one production at a time, unlike the variety of flavors at your local ice cream shop. Have you found that contacting patrons after shows increases the return rate? Also, what type of follow up have you found works best after people attend their first show? I think that making contact again is really useful. My favorite way of making the contact is to encourage people to tell their friends about it. And what some theaters do that I think really doesn’t work is say, “Pass this message along to your friends and they’re entitled to a $5 discount.” The discount isn’t what does it. The point is that people can really enjoy a show but really not have the capacity to explain the show, what’s it about, what they loved about it and the organization should be able to do that well. Another thing I really like, a few months ago I went to the San Francisco Ballet and two days later, I got an email from the ballet, thanking me for coming along with two brief videos. One video was an interview with an amazing dancer, who talked about what it felt like to her to do this unusual dance and how she prepared mentally for it. It was fascinating. There was also a brief interview with one of the choreographers and having already seen his dance, it brought it alive for me in ways that I wouldn’t have appreciated before seeing the show. So it really was an enriching experience. In regards to making it easy for patrons to return to a theatre, do you think it’s a good idea to have season tickets and flex passes? Yes. And I also think it’s a good idea to allow people to choose their own productions to attend. This needs to be customer-centered. You lose people if they don’t want to see what you package for them. Don’t have a subscription brochure; have a season brochure. Make sure your patrons understand that the people who are the full season subscribers get seated first and get the most benefits. And if you choose your own and only come to certain ones, you don’t get as many benefits and you don’t get the free guest tickets and that kind of thing. But you can choose exactly what you want to attend. Remember that the flex pass is a benefit to the organization much more than to the patron. Our clients can have ticket buyers answer survey questions before they checkout. What are some questions theatres can ask to help them better understand their audience and how they should market to them? Thanks Joanne for sharing your wisdom on how theatres can increase their ticket sales and increase their repeat patrons! You can learn more about Joanne Bernstein on her website and read more of her advice on her blog. Checkout our other interviews with Joanne. Click here to learn how to increase your theatre’s revenue and here to read Joanne’s advice on managing your box office. If you have questions for Joanne, please post them in the comments below. Want to sell tickets to your events? Sign up for WellAttended.